"This shrimp scampi recipe varies from the typical one as there are sun dried tomatoes in the recipe. This is like eye candy when presented in a warmed ramekin dish with some chopped parsley and a sprinkle of Parmesan cheese added to the top. 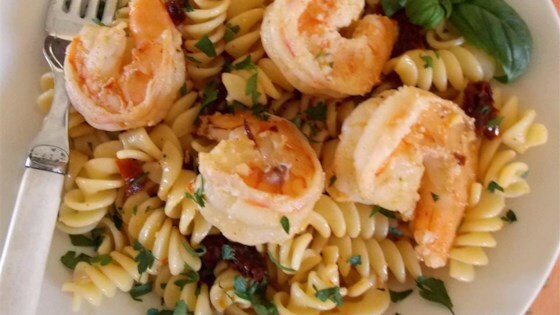 Hubby says this is his favorite scampi and better than any he gets at an upscale restaurant." Bring a large pot of lightly salted water to a boil. Cook rotini at a boil until tender yet firm to the bite, about 8 minutes; drain. Melt butter in a large skillet over medium-low heat. Cook shrimp in hot butter until mostly pink, 3 to 5 minutes. Add garlic and cook until fragrant, about 1 minute. Pour white wine, lemon juice, and Worcestershire sauce over the shrimp mixture; cook until fragrant, about 2 minutes. Sprinkle tomatoes and parsley over the shrimp mixture; cook until the tomatoes are warmed, about 1 minute. Divide pasta between 2 bowls; top each portion with about half the shrimp and sauce. Garnish with Parmesan cheese. I use sun dried tomatoes packed in olive oil. I feel they have more flavor. Made this last night. It turned out perfectly, I got rave reviews from room mate who is a very picky eater!